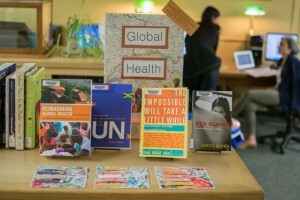 This term, we worked with Natural Doctors International (NDI) to expand our collection of global health books. Take a little time out of your day to check out our new display with NDI’s recommended titles! Be sure to take a homemade bookmark too! “Because our medicine transcends borders it’s important that we start the conversation about how to create access and how we may deliver culturally humble health care -with some thought-provoking, inspirational reading”— NDI member.